In celebration of the 150th year of Confederation, we are trying to visit every Canadian National Park that we can drive to. This is the eastern portion of that tour. Lightning and thunder woke me up during the night but fortunately it was short-lived and I was able to get some more sleep before the morning. When I was finally able to extricate myself from under the mass of dogs to emerge into the sunny day, I was amazed at how well the tent had shed the rain since I had expected it to be waterlogged with the deluge. When the dogs followed me out, I noticed that Piper was favouring one of her back legs. She has one leg that sometimes gets sore if we overdo the exercise so the hiking was going to be restricted to short pee breaks. At least we were on the way home anyway. We stopped at An Octopus’ Garden in Alma for breakfast. We had been there two years before and I knew the dogs would be able to sit on the patio with me so we could enjoy a civilized breakfast. I ordered the pancakes with a side of bacon (yes the bacon was for the dogs) and I took advantage of the wifi to plan our day. 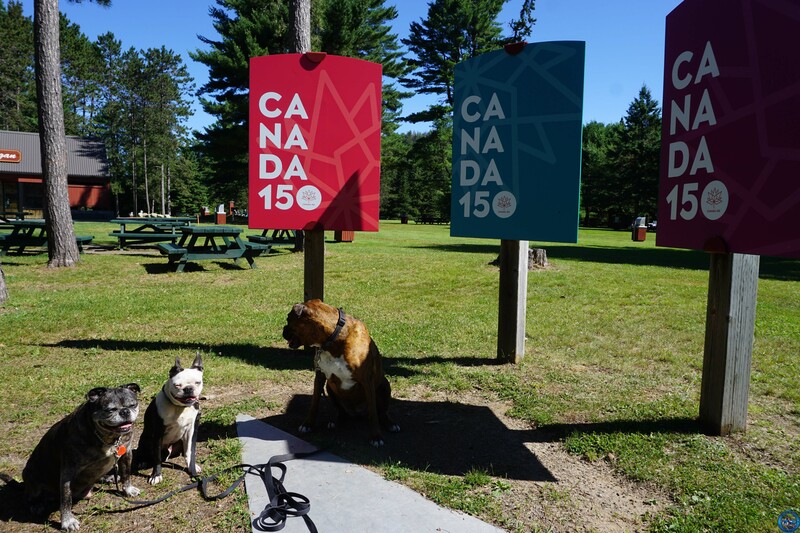 We were heading back into Quebec to visit La Mauricie National Park but when I checked the availability of camping sites, I learned that all the sites were taken. No worry; we are road trip warriors and we would manage. Freestyle road tripping at it’s finest. Onwards we go! We drove north towards the New Brunswick/Quebec border where we happened to drive through Grand Falls. 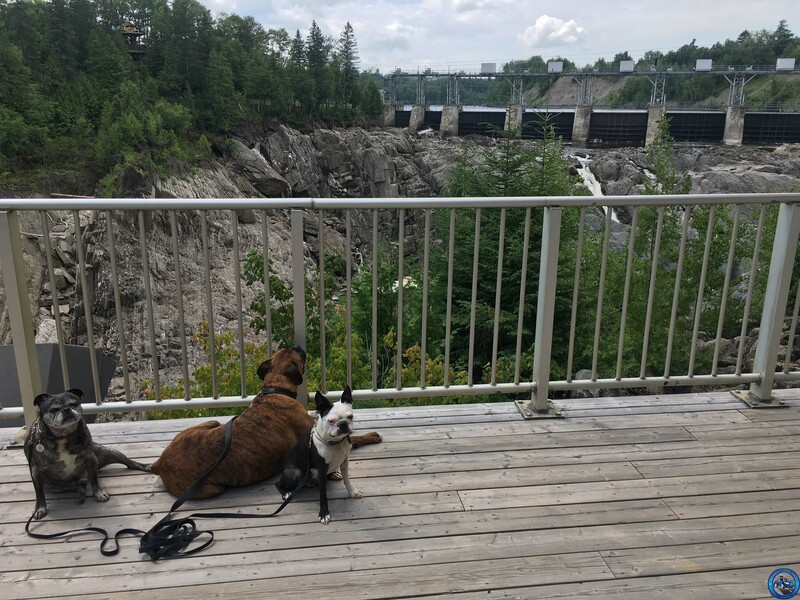 Well you know that when I saw a sign for The Grand Falls Gorge, I had to stop to check it out and give the dogs a walk break. Given that we were limited to where we could go on account of Piper, we didn’t have the chance to explore the gorge far below but we did watch several people cross the gorge on zip lines. I asked the dogs if they wanted to zip line across but they seemed uninterested in the prospect so we hopped back in the car. I was listening to the radio when I started hearing reports for severe thunderstorms in the region. The more I listened, the larger and more severe the thunderstorms sounded. We were just outside of Trois-Rivieres when I had to make the decision about whether we would camp or find a hotel. I was able to find two separate campgrounds and both were full. Well that settled it for me. A quick consult of Expedia and we were soon heading to Motel Becancour. On the other side of Trois-Rivieres. Which was now behind us. Oh darn. I was following the directions from my phone as we turned back south, drove past Trois-Rivieres, drove into the countryside, kept driving…wait…where is this place…I began to wonder if my phone was playing some kind of joke on me when the motel, and town, seemed to pop out of nowhere. 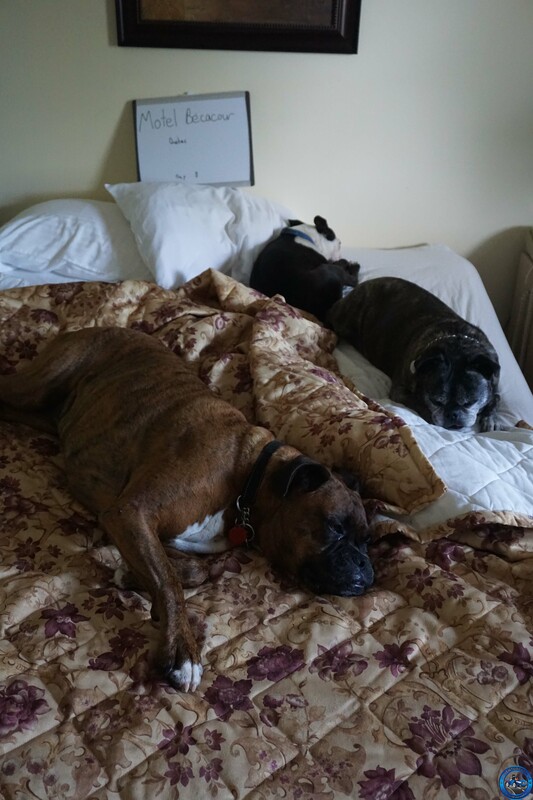 I checked in and soon was unloading the dogs and gear into our room. I find that I like motels more than hotels if for no other reason than the convenience of being able to walk from trunk to room with minimal steps. It’s an older motel with dated decor but it was clean and, here’s the important part, no risk from thunderstorms. It’s nice to find a place in the middle of nowhere. After moving our gear from the car and taking the dogs for a short walk, I realized that I was famished. Becancour is a small town but after all the driving, I just wanted to sit there and have food brought to me and the delivery options were fairly limited. As in next to none. 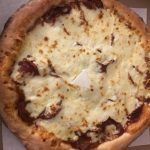 I finally settled on Stratos Pizzeria and even though they proclaim to be “Le roi de la poutine” (the king of poutine I think), I ordered a pizza. And what was this? They have a special? I get onion rings too? How does one turn that down? 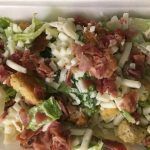 Well this one does not turn down free onion rings but since there had been a decided lack of vegetable matter recently, I added a caesar salad to the order. In really short order, I had my food knocking at my door. I ate my salad. 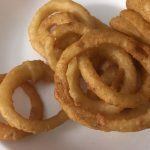 I chomped at my onion rings. I lifted the lid on the box to grab a slice…hmmmm…apparently someone forgot to cut the pizza. No need to panic. I grabbed the plastic knife that came with my fork and was soon struggling to hack my way through all that cheesy goodness. Once I finally got through, I realized why I had so much trouble cutting through: this was one deep pizza, loaded with a thick layer of pepperoni under the cheese. Oh my. I ate a lot of that pizza before finally falling into a food-induced coma. The morning of Day Nine, we lazily packed up and headed out. I noticed that nary a drop of moisture was on my car. The ground showed none of the telltale signs of rain. So the severe thunderstorms that were supposed to hit the entire region did not. Oh well. At least we didn’t end up sleeping in the car again. 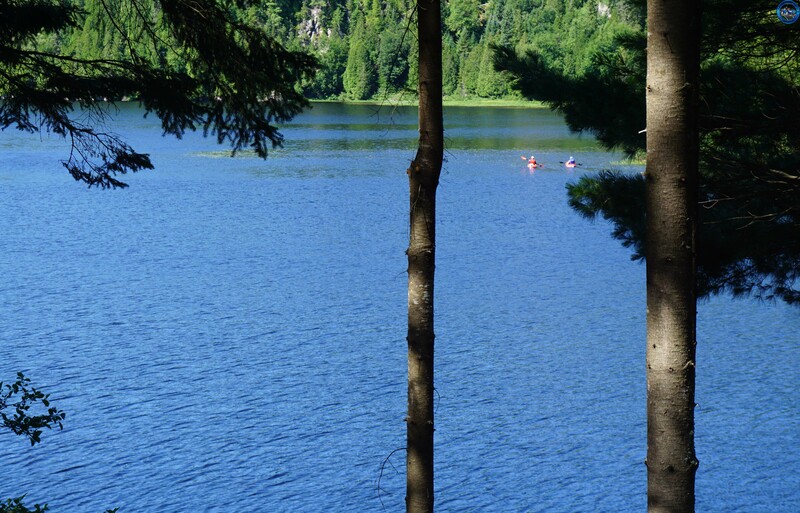 We continued on and a short time later we arrived at La Mauricie National Park. 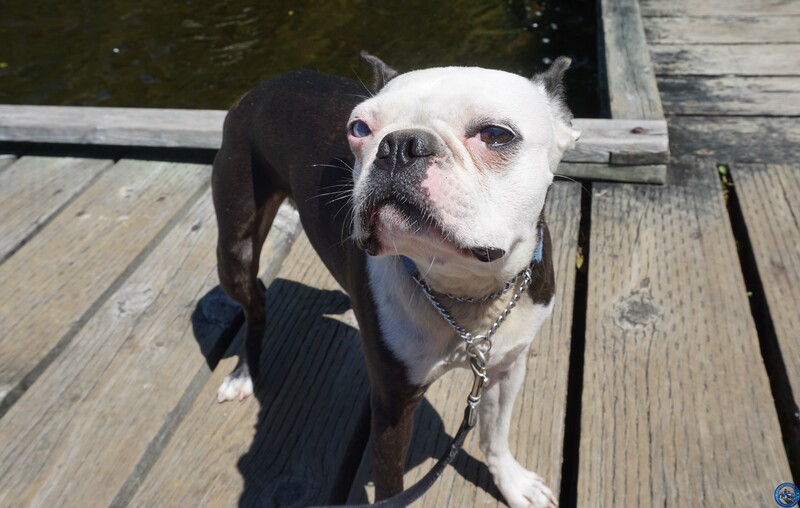 I rolled up and was greeted by the young woman in the booth who took one look at the dogs and, as she handed me a stack of brochures and maps, told me that they would have to not only have to be on leash but could not go anywhere other than picnic areas. One small page of paper actually spelled it all out for me. Given Piper’s ouchy leg, it wasn’t a big concern for me but I asked her what was the reason for that rule. All she could tell me was that it was because of the wildlife. As we drove off, I pondered that answer. Nothing about La Mauricie seemed unusual. Sable Island National Park, with it’s population of wild horses, well THAT made sense. This did not and I made a note to follow up on that later. Oh look a picnic area. We could go there. As I unloaded the dogs, one of the park staff approached and made sure that I knew the dogs weren’t allowed in most places. Wow they take this sort of thing seriously. 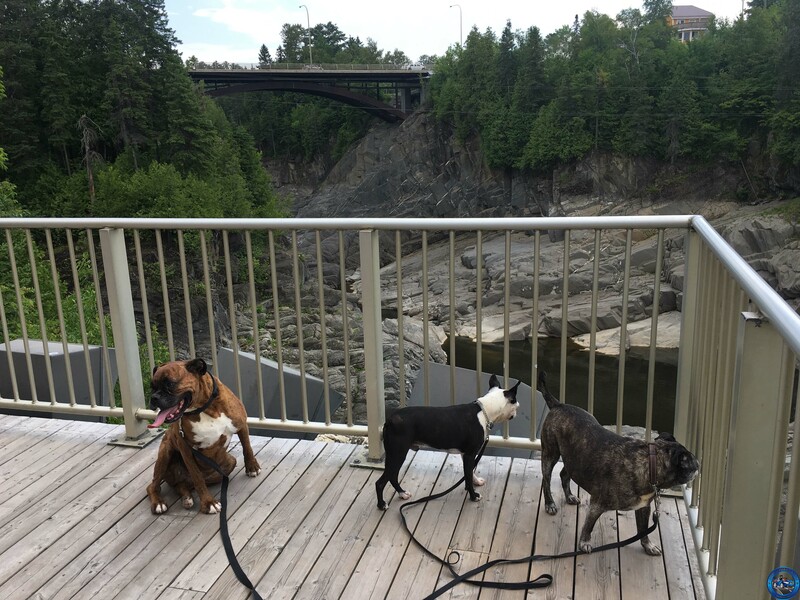 We made the short stroll to the picnic area, snapped a few pictures, and even then we broke the rules because I took a few steps onto a bridge with the dogs to get a photo of the river and some kayakers (please don’t tell on me). I got the dogs back into the car and we drove to the next spot that had a picnic sign at the road. 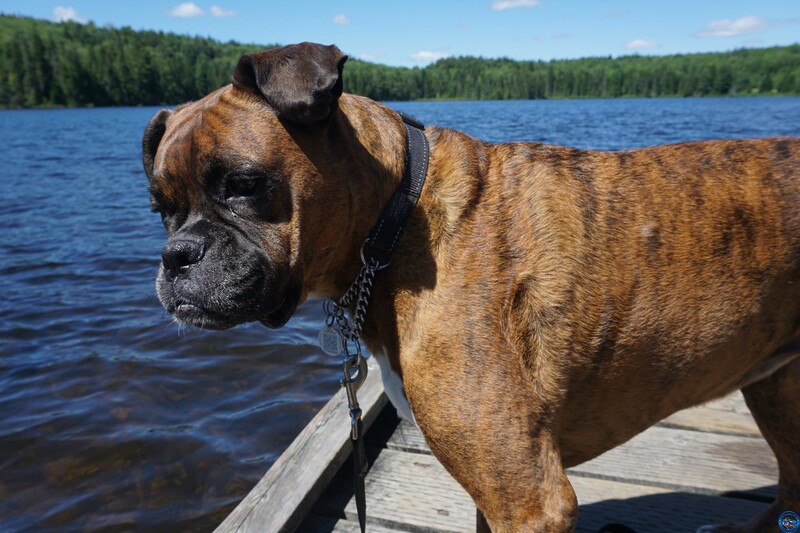 We found a quiet lake with a dock that jutted out far from the bank. I will admit that we sat there in the sun for a long time and just enjoyed the sound of water beneath us. I think Jack would have been content to sit there all day and bake in the heat. I’ll admit that I would have been happy to sit for a bit longer but the road, well it needed to be travelled so we got back into the car and continued to the next picnic area where we found a large canoe tied to the dock. 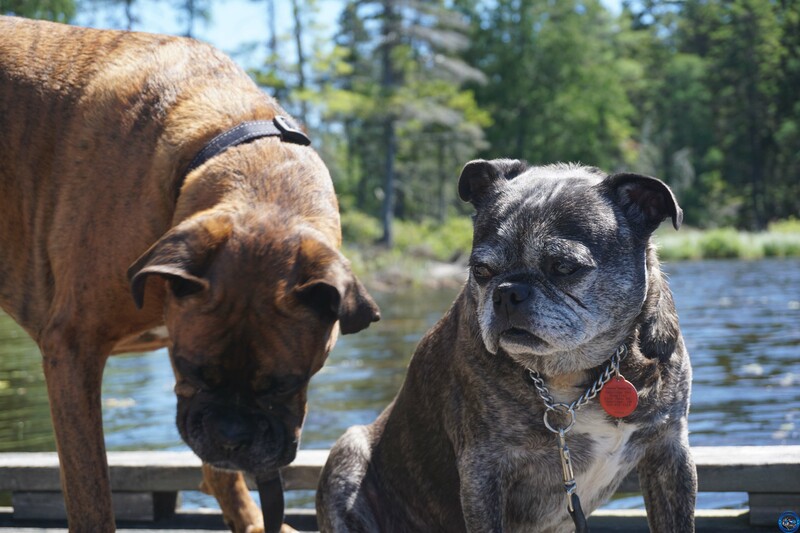 I was totally tempted to get the dogs to jump into the canoe for a photo but decided that sitting on the bank would be a safer option. Yes I was standing on a bridge when I took this photo. How could I pass up this shot? By this time, we were almost out of the park. I noticed on the map that we would be passing through Ottawa. A friend of mine had moved to Ottawa the previous year and had asked if I’d be interested in camping a night with her. Wouldn’t luck have it, “we” were camping at Voyageur Provincial Park which is about an hour outside Ottawa. I wasn’t sure who “we” were and just assumed it was some of the old girlfriends. Well wouldn’t you know it but Voyageur Provincial Park is really close to Beau’s All Natural Brewing Co. Since I couldn’t stop for food to contribute and I didn’t see any farmer’s stands, I could at least bring beverages. An added bonus: dogs are allowed inside and out. YAY! Seriously I think I hopped from foot to foot when I heard that. Inside we go. With the nice cool room and free samples, we lingered there for quite some time. I appreciated the bowls of water that were out and a steady supply of dog cookies although I’m sure the dogs appreciated them more. Now I have never heard of a milk stout before but holy cow (get it?) is it ever good! 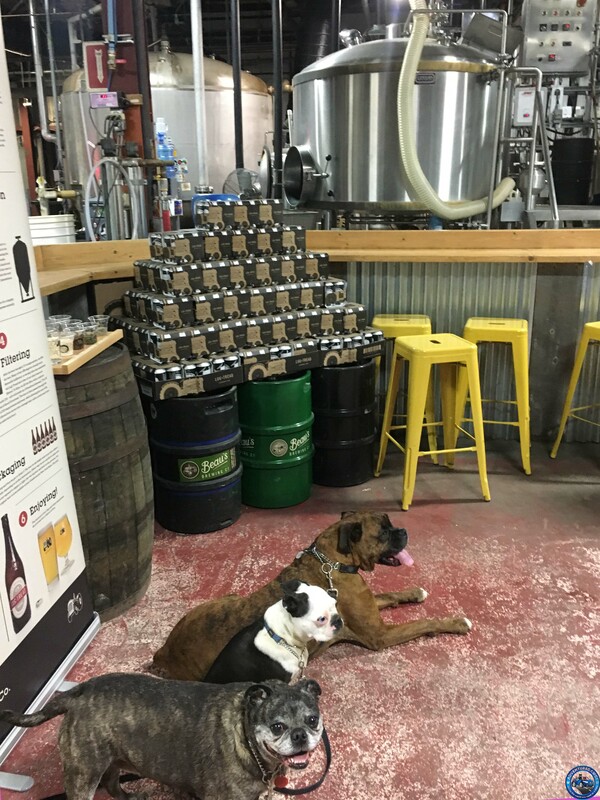 I left with a few bottles and entertained plenty of people when I posed the dogs for a few pics. We learned how to make beer and entertained folks. It turns out that I beat my friend to the park but when I saw the site they had assigned, well it was less than stellar. The ground was saturated, the ground was thick mud, a runoff ditch was full of water along the back, deep tire tracks crossed most of the site, and the mosquitos were absolutely horrendous. Fortunately they were able to change sites when they arrived. That was when I realized “we” was my friend and her new boyfriend. Well didn’t I feel like the third wheel. We chatted, we caught up, we went and visited the nearby beach before cooking dinner and sampling the beverages from our travels. Piper’s leg seemed to be a bit better when she had a chance to stretch it out but we still took it really easy. 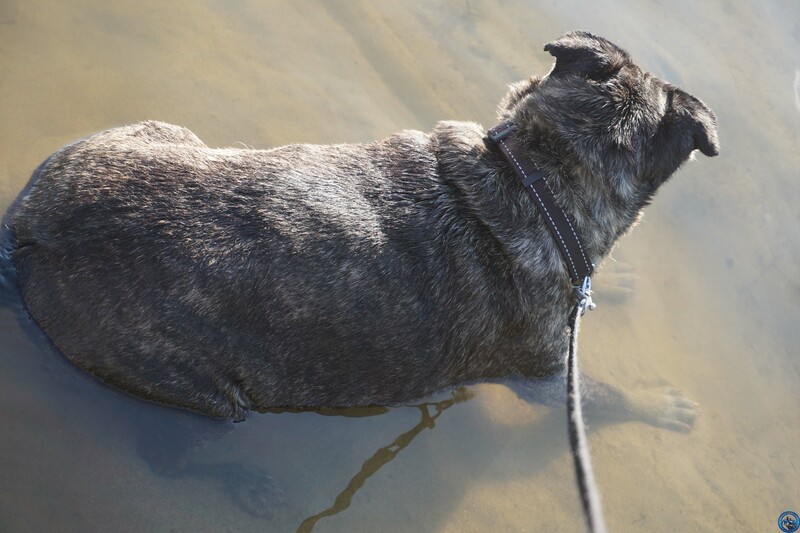 Once Jack got in the water, he laid down in it. Leo just wanted to roll in the sand. Jack is actually laying down in the water. Try and tell me he’s not a water dog. My friend taught me a trick for a camping dessert: slice a banana length-wise and place peanut butter cup halves down the cut. Wrap in tin foil and place over a fire or in the coals. Once it’s good and warm, unwrap and devour. It has everything that is good in the world wrapped in a warm hug. With a belly full of warm banana, chocolate, and peanut butter, and then further warmed by vodka, the dogs and I crawled into my tent and soon fell into a blissful slumber. 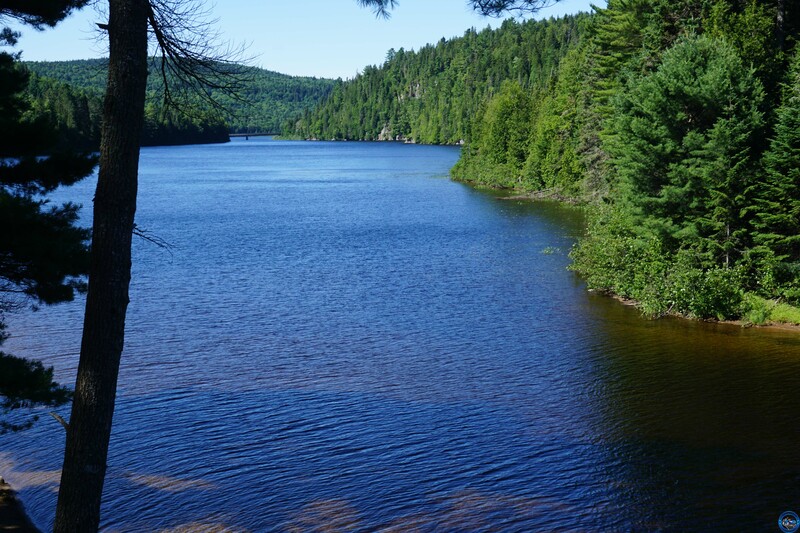 La Mauricie National Park – Highway 55 runs along the east side of La Mauricie National Park. A parkway loops off of Highway 55 and cuts through the south end of the park. Voyageur Provincial Park – The park is just outside of Hawkesbury off the Transcanada Highway. 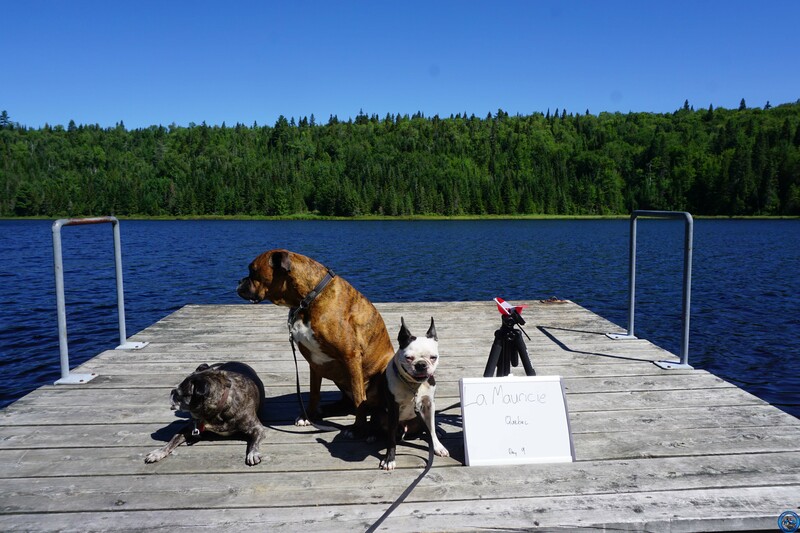 La Mauricie National Park: If you have dogs, you’ll be extremely limited in the areas you can go. It’s too bad because it is such a pretty place to visit. 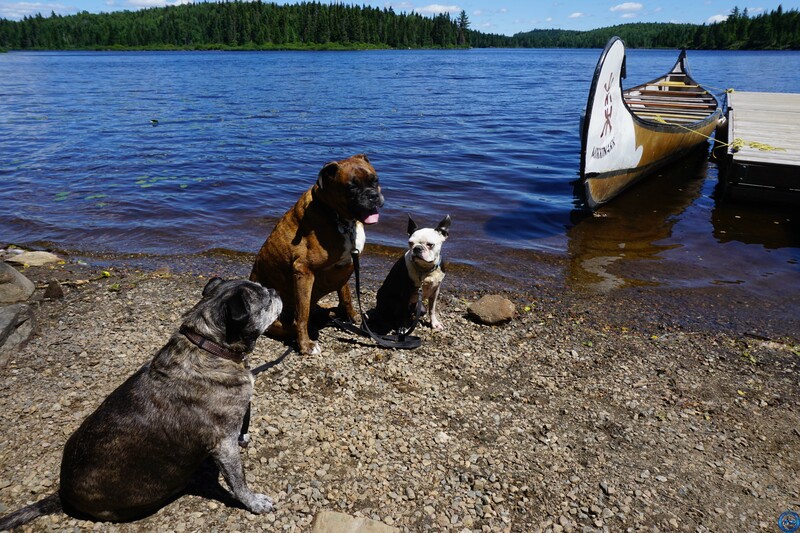 If you are travelling without dogs, hiking, cycling, fishing, and boating all seemed to be very popular. There are semi-serviced, unserviced, and backcountry camping sites available as well as some oTENTiks for rent. As I did not see any of them, I cannot give any feedback about the sites or facilities. Voyageur Provincial Park: The park is on the Ottawa River with four sandy beaches. There is plenty of space to fish, boat, and canoe. Hiking and birding are also popular activities. The park is fairly level and on slow water which makes it ideal for families with young children. 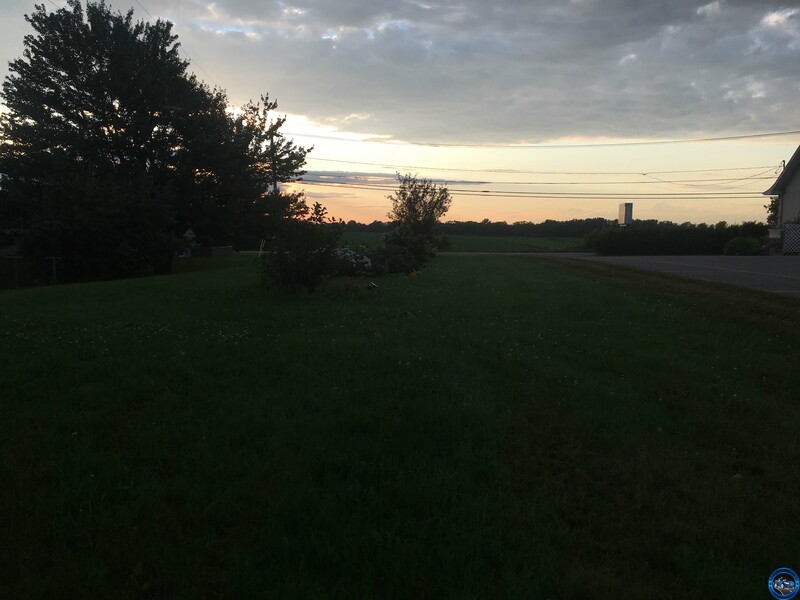 It is a smaller park with serviced and unserviced campsites. The city of Trois-Rivieres is less than an hour away and there are smaller towns in between. The pizza at Stratos Pizzeria in Becancour is pretty darned good. 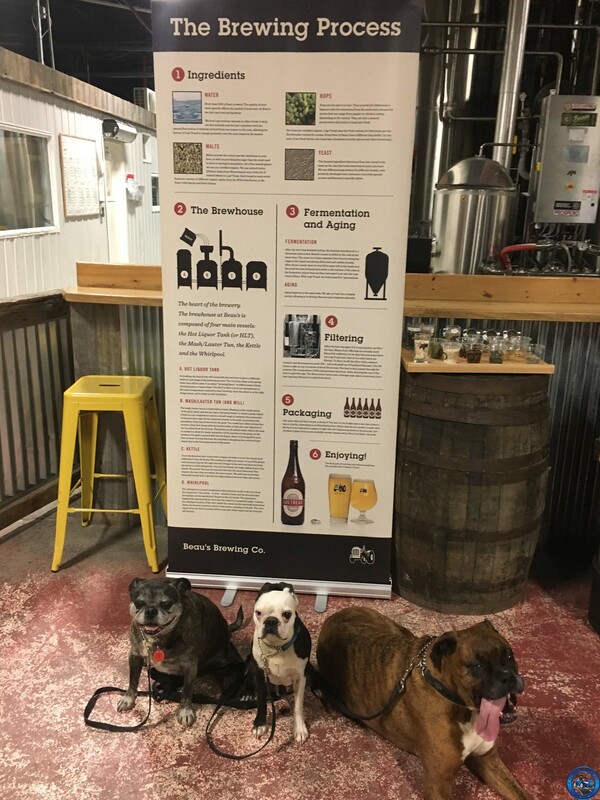 If you like beer and are heading close to Ottawa, a stop at Beau’s All Natural Brewing Co. is a must. With Hawkesbury so close to Voyageur, finding places to eat is a snap. 6 response to "A Slight Hiccup"
You’re pictures are wonderful. The lake areas are so pristine and beautiful. Glad Piper’s leg is feeling better. Even though the severe weather didn’t happen, I think you were wise to opt for a motel. I’ve camped in severe weather before, and it is NOT fun. Thank you. That leg of hers bothers me more than it bothers her sometimes. She just tucks it up and keeps going. I don’t mind the rain, it’s packing up in the rain that I hate. It just seems to feel so soggy and cranky. What a couple of fun days! Gorgeous photos and totally worth breaking the rule (your secret is safe with me) Milk stout, eh? Will have to check that one out. Hope Piper’s leg is doing much better. I hate that part about the national parks!! That’s why we explore national forests all the time. Most state parks don’t allow dogs on the trails either. I like your notebook idea! Nice touch! I know right? The worst part was that it was totally different from all the other parks. They are all run by the same organization. Drives me nuts. With so much travelling keeping track of things gets a bit sticky. Copyright © 2018 AdventureDawgs. All rights reserved.